Thankfully, it wasn’t too weird at Fisher Investments, an independent money management firm 20 minutes outside of Portland. As an intern at Fisher Investments, I learned about capital markets, investment strategy, and surprisingly, sales. I hadn’t anticipated learning about sales, but it proved to be one of the most valuable skills I grew. My head was spinning with new knowledge of how to influence others, actively listen to the customer, and move business forward. Ultimately, I understood that selling is at the core of every business; without sales, there isn’t business. Be hungry for feedback, but ignore naysayers. When I initially had the idea to sell invisible ice cream, I didn’t realize the road to profitability would be paved with naysayers. The idea, and the process by which we were to sell it, needed to be developed, not destroyed. In planning to sell invisible ice cream, constructive criticism was a feast for the starved; a means by which we could readily improve before making any big mistakes. I sought out feedback from my family and intern friends- people I could trust and who were willing to share their honest insight. Their feedback on the business plan helped shape it into an experiment that had the potential to reach profitability. 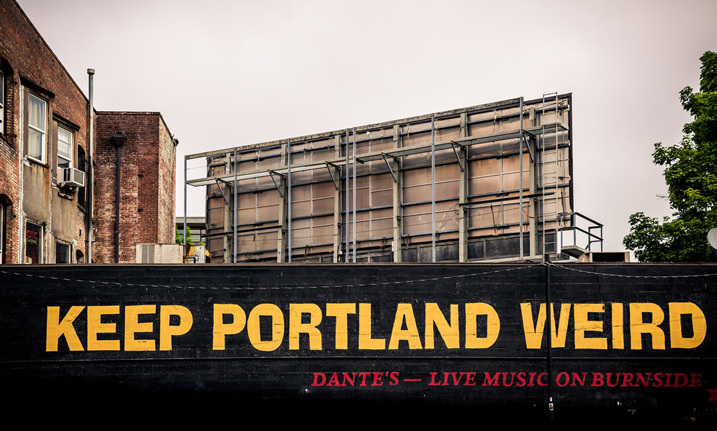 Without their honest feedback, we would have been left to only hear the pessimistic naysayers. They were there at every step along the way- ready to tell me why the idea wouldn’t work. To grow profitably, we had to look past the negativity and to seek out constructive feedback. In sales, and in life, it is important be hungry for feedback, but to ignore naysayers. Sales are built on relationships (surprise!). But to build relationships, you must know your customers. We knew that people in Portland would be interested in buying ‘weird’ products, hence, invisible ice cream. Our product was strange enough to garner attention, but attention is all that our product could give us. It couldn’t build relationships for us. To build relationships, it’s important to remove barriers and to get on the same level as your customers. We did this by dressing the part, sharing a genuine smile, and standing anywhere except behind our table. Even with a ridiculously silly product, we aimed to be approachable and trustworthy. Our strategy worked. We had all sorts of people interested in our product! We talked with curious children and their smiling parents, comedic old men trying to pay us with their “invisible money,” and even other street vendors who had never seen anything so strange. Customers can buy products from many outlets, they stay with you because of the relationship you’ve built. To build long-term relationships with your customers, you need to be caught in honesty instead of lies, humanize yourself, communicate early and often, and always have your customer’s best interest in mind. If you’re not excited about your product, who will be? The emotion of excitement is contagious, especially in sales. 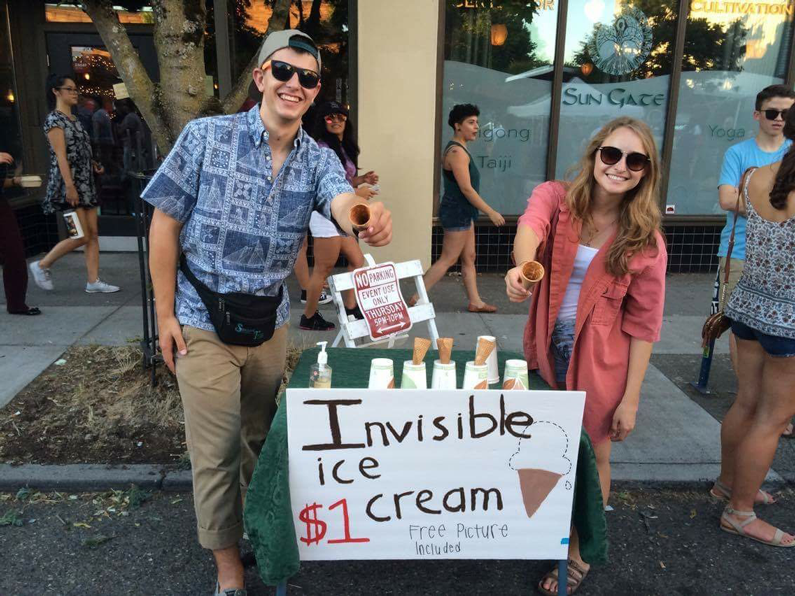 While on the streets of Portland, I made sure to let others know how passionate I was about invisible ice cream. I had one-liners about how our ice cream was better than the *real* ice cream down the street. The energy we exuded encouraged people to investigate what we were so excited about. It is easy to be enthusiastic about a new product, but what happens when the process becomes monotonous? At that point, it’s best to try getting excited about the little things. Why not celebrate every sale, a minor update to your product, or even just seeing a customer you haven’t seen in a while? If we only get excited about the big things in life, how are we to be eager about the normalcy of selling the same product each day? Let your genuine excitement drive you, and the sales will come pouring i. Continue selling even when the sales don’t come. While selling our unique product, we found a common theme: potential customers loved to say no. This is no new revelation- rejection in sales is common. At one point, we hadn’t made a sale in over an hour. This was discouraging because we averaged a sale every ten minutes in the previous hour. But we decided to choose our attitude, and kept at it. In our final twenty minutes, we made more sales than we had made all day. If we had been discouraged and closed early, we would have missed out on the most rewarding opportunities. Zig Ziglar, a world-renowned salesman and motivational speaker, said that, “Every sale has five basic obstacles: no need, no money, no hurry, no desire, no trust.” Getting a no is an obstacle in every sale, but that should never stop you. While every no is not in your control, it can be an opportunity for growth. Let every no push you to improve your pitch, your interpersonal skills, or your ability to close the deal. Every salesperson will experience the defeat of hearing a no- why not choose to let it propel you forward instead of push you down?